Six years after the enactment of the law to establish an administrative process for revoking thousands of women's falsely obtained exemptions for having religious beliefs that conflict with IDF service, the process of approving the regulations to prevent such women from dodging the draft has not occurred, despite the continued phony claims of religious values. Thousands of girls are exempted from conscription every year on the basis of false affidavits that their religious beliefs prevent them from serving in the army, even though they lead a secular lifestyles. Hiddush believes that there is no problem women getting exemptions for religious reasons, and that the women need not live Orthodox lives in order for the criteria to apply. Following a petition by Hiddush to the High Court of Justice, a draft of the regulations mandated by the law passed in 2012 was submitted, which, if approved, will finally enable the implementation of that same law enacted six years ago. The regulations are expected to be discussed by a joint Knesset committee on January 2. Now it remains to be seen whether the draft regulations will be approved at the meeting on January 2, or whether the ultra-Orthodox poltical parties and the Chief Rabbinate will interfere to prevent this. Nearly six years have passed since the Knesset voted to amend the Defense Service Law to allow the IDF to act administratively against women who made false claims of religious beliefs. This would be done by establishing a committee to revoke IDF exemptions when it has been proven that some women do not meet the criteria. According to the current legal situation, the exemption can be revoked only when a woman is prosecuted and convicted by the Court. However, as a condition for enacting the law, which passed in March 2012, regulations were required for its implementation, which the law ordered to be sumitted within 30 days of the law's passage. Despite the passage of time and the increasing incidents of women's draft dodging based on false claims, the necessary regulations were not been formulated nor approved, until Hiddush petitioned the High Court of Justice in early 2017, demanding that the Knesset and the Minister of Defense be required to act on this matter. Under the threat of an expected hearing at the High Court of Justice, a draft of regulations was submitted to the Knesset by the Ministry of Defense, and last week a joint committee of the Knesset Foreign Affairs and Defense Committee and the Knesset Constitution Committee was appointed, whose approval of the regulations is required by law. It is scheduled to convene for discussion of the proposed regulations on January 2, 2017. In a hearing held this week, the State asked that the petition be withdrawn on the basis of the fact that the process of approving the regulations has begun. Hiddush, however, vehemently opposed this, and pointed out that the draft regulations had merely been submitted, not approved. The appointment of the committee and the setting of a date for its meeting do not guarantee that the regulations will indeed be approved in the foreseeable future. The High Court therefore ruled that the Knesset and the State must update the Court within 60 days regarding the completion of the process, and on the basis of the update, the Court will determine how to act on the petition and will also decide on the issue of an expense ruling in favor of the petitioner, Hiddush. It is no secret that there is a political and religious struggle over the issue of enlisting women into the IDF. We have no doubt that this fundamental argument, wherein the ultra-Orthodox political parties and the Chief Rabbinate maintain that it is forbidden to recruit women into the army, is the basis of the ongoing failure to pass the regulations required to implement the law. It is no secret that there is a political and religious struggle over the issue of enlisting women into the IDF. We have no doubt that this fundamental argument, wherein the ultra-Orthodox political parties and the Chief Rabbinate maintain that it is forbidden to recruit women into the army, is the basis of the ongoing failure to pass the regulations required to implement the law. The importance of Hiddush's petition is especially evident in view of the large extent of draft dodging and the violation of the rule of law, as well as the disgrace to Judaism and the religious way of life. Now it remains to be seen whether the draft regulations will be approved at the meeting on January 2, or whether the ultra-Orthodox poltical parties and the Chief Rabbinate will interfere to prevent this. It also bears noting that two out of the five members of the administrative committee created by the 2012 law to revoke false exemptions are representatives of the Chief Rabbinate, which declares that no women should serve in the IDF at all, and its ally - the IDF Rabbinate. According to IDF data, thousands of women receive exemptions from conscription every year based on false religious declarations, even though they maintain a secular lifestyle. All that is required of them is to declare that they are religious before a judge at the Rabbinical Court, and the exemption is automatically granted to them. Unlike other exemptions, the IDF can not revoke an exemption granted on the basis of a religious declaration even if there is clear evidence that it was obtained fraudulently. Rather, a criminal conviction is required in Court as a condition for revoking the exemption. The ease with which an exemption can be obtained this way, along with the difficulty faced by the IDF in acting against women who make such false declarations, has resulted in thousands of women (some 10% of the women's recruited annually) dodging their service in such a way every year. In order to try to resolve this failure, in March 2012 the Knesset approved Amendment 18 to the Defense Service Law. The amendment is supposed to make it easier for the IDF to act against women who falsely declare religious beliefs by establishing an administrative committee that could deny the exemption when it is proven that women do not meet the criteria. The Knesset conditioned the law's implementation upon the enactment of regulations to regulate the activity of that committee. It was determined that these regulations would be drafted by the Minister of Defense, and would be submitted within 30 days to the approval of a joint committee of the Knesset Foreign Affairs and Defense Committee and the Knesset Constitution, Law and Justice Committee. But to this day, close to 6 years and 3 Knessets since the date of the Law's passage, no regulations have been approved. The Knesset committee held only one meeting in 2014, and nothing has progressed since then. Without these regulations - the Defense Minister cannot set up the committee and the women who make false declarations are almost entirely protected from conscription. Hiddush appealed to the chairpersons of the committees to discuss the regulations of the law, but they claimed that the Ministry of Defense did not send them a draft, while the Ministry of Defense claimed that it had sent on the wording of regulations years ago, and that the delay is the committees'. Hiddush appealed to the chairpersons of the committees to discuss the regulations of the law, but they claimed that the Ministry of Defense did not send them a draft, while the Ministry of Defense claimed that it had sent on the wording of regulations years ago, and that the delay is the committees'. While each side places responsibility on the other, the law remains unimplemented and mass draft dodging through false affidavits continues. As a result, Hiddush petitioned the High Court of Justice in January 2017, through attorneys Uri Regev and Sagi Agmon, in order to compel the heads of the committees and Ministers to immediately act and approve the regulations in accordance with the requirements of the law. The Defense Service Law grants an exemption from IDF service on the grounds of religious recognition for a religious woman who declares to a rabbinic court judge her religious way of life (i.e. she keeps kosher and does not travel on Shabbat). By law, the only way to revoke this exemption is to convict such a person in Court. The ease with which the exemption can be obtained for reasons of religious recognition, in addition to the inherent difficulty faced by the IDF in proving that an affidavit submitted was false (which requires a criminal conviction), create a great temptation for women who wish to be exempt from service. The IDF's ability to act against such is very limited. 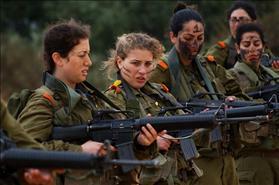 According to data published by the IDF, of women born in 1998 (whose main recruitment is in 2016) only 58.1% enlisted, and approximately 42% of the women were exempt from military service. The vast majority of those exempted (34.7%) were exempted on the basis of declarations of religious beliefs. For comparison, all the other exemptions - for medical reasons, for marriage, living abroad, etc., constitute 7.2% of the total exemptions. In other words, 83% of the recipients of exemptions from the IDF, receive these on the basis of religious claims. Although the number of exemption recipients continues to rise from year to year, data received by Hiddush from the IDF indicate that in recent years the number of investigations conducted against such women stands at dozens, and no enforcement measures have been taken against them. According to the IDF, between 10 and 25 percent of those exempted (about 2,000 to 4,000 women a year) are illegally exempted. In other words, they make false declarations or they cease to be religious after receiving exemptions and do not report this to the IDF (despite the fact that the law requires it), continuing to enjoy the exemption.